1	Preheat the oven to 200°C, gas mark 6. Cut each aubergine lengthways into 6 thin, even slices about 5-10mm thick. Arrange the slices in a single layer over two baking trays. Brush both sides of each slice with olive oil and bake in the oven for 15 minutes until golden and tender, turning halfway through cooking. 2	Meanwhile, place the spinach in a saucepan and cook gently until wilted. Drain and leave to cool. When cool enough to handle squeeze out the excess liquid and then chop finely. Place the chopped spinach in a bowl and mix with most of the Parmigiano Reggiano (reserving some for the top), ricotta cheese, lemon zest and parsley, then season. 3	Mix together the passata and sundried tomato paste, and spoon into the base of two shallow and ovenproof dishes about 18x13cm in size. Lay a slice of aubergine onto a chopping board and spoon a heaped tablespoon of the spinach mixture at one end and roll up. 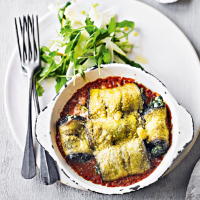 Place the roll in the dish in the tomato sauce and repeat with the remaining slices of aubergine and filling. 4	Sprinkle over the remaining cheese and drizzle with a little oil. Bake for 20 minutes until the sauce is bubbling. This recipe was first published in Thu Feb 08 09:47:00 GMT 2018.